Holy amazement, these were phenomenal. My boyfriend says they are his favorite protein recipe yet. It took all I had not to eat them ALL. Super easy to make, and gives you a taste of that homemade apple pie we all love so much! 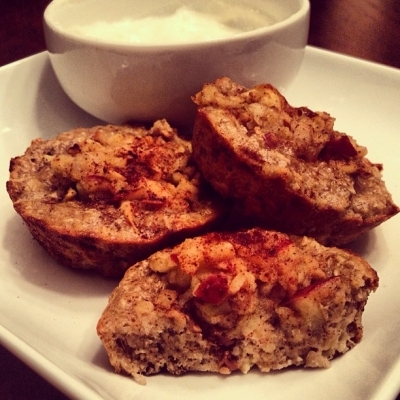 Mix everything with a mixer (leave out apple, 2 tsp cinnamon, 1/4 cup apple sauce, and agave nectar for â€œfillingâ€). Place mixture in greased muffin tin (yields 12). Chop apple finely in express food chopper (Ninja), then mix with remainder of cinnamon, applesauce, and agave nectar left out from earlier to make the filling, then place on top of cookie dough mixtures (disperse evenly among 12). Pat the filling mixture into the center of the dough just a tiny bit. Bake on 350 for 15 minutes. I served with nonfat Greek yogurt mixed with vanilla whey to dip in (not included in nutritional panel)!